Given that this is the penultimate episode of Wagaya no Oinari-sama, you would be well within your rights to expect something a little more substantial with regard to the overall story from this particular instalment, but oddly that's no what we get here. Thankfully though, we get the next best thing (or, I could argue, an even better thing) in the form of an entirely Sakura-centric episode. Sakura fanboy that I am, I absolutely lapped it up. 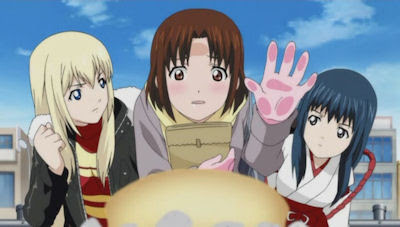 In essence, this is "the diet episode" of the series, with both Sakura and Kou worrying about their weight for differing reasons (and building up to an obvious yet still mildly amusing punchline in the latter's case) and choosing to go on a diet. Never mind the rest of the plot, the upshot of this is that we get plenty of Sakura screentime in this episode, which once again proves my point that she's the best thing to happen to Wagaya no Oinari-sama and is well and truly worthy of a spin-off series of her own. As I just mentioned, this seems like an odd way to fill up the penultimate episode of the series, which leaves me wondering just how it's going to end, as any storyline will only have a single episode to spare to wrap things up in a suitable fashion. It also leads me to assume that the Noboru/Miyabe/Sakura triangle isn't going to get wrapped up by this series, which could prove to be a bit of a dsiappointment as it's been one of the more interesting aspects of the show in recent times. Ah well, roll on the end of this series, although I have to admit that I'll miss Sakura's input into this series, which has easily been its biggest positive overall for me personally.